The modern world we live in often requires components made from materials that are stronger and lighter than the more common materials of steel, aluminum, and wood. Today, everything from bicycle frames to aircraft components are made from composite materials such as Kevlar and Carbon Fiber. Unlike those other materials, composite components don't rust or rot, and they won't be dented by a minor impact. With the growing interest in these new high-tech materials, there are more and more individuals looking for help in building their own components from composites.While most of us assume that building from composites requires special skills and tooling found only in specialist shops and well-equipped industrial facilities, nothing could be further from the truth. Professor of Industrial Design, well-known author John Wanberg uses 176 pages and more than 400 images to explain and illustrate the techniques and tools that readers need to make their own components from composite materials. Whether it's a simple piece that requires no mold or a more elaborate fabrication project that requires both a mold and vacuum bagging, all the necessary how-to information is contained in this new book from Wolfgang Publications. 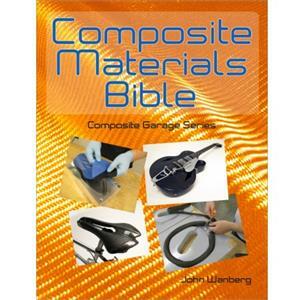 This new book from John Wanberg combines materials from four previous books plus adds a wealth of new material on the latest trends and techniques in the world of high-tech composite materials. All of the projects and techniques included in this 176-page book are aimed at individuals and small shops.